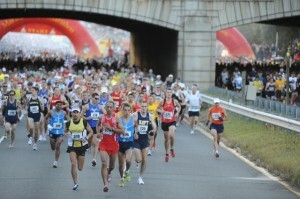 The 37th annual Marine Corps Marathon will be held on Sunday, October 28, 2012. Amateur radio has traditionally supported the foot race with radio operators positioned all along the 26 mile course and at key medical facilities staffed by Navy medical. In addition those certified Arlington RACES personnel have supported Arlington Fire/EMS by being the link between these first responders and the radio operators on the course. If you wish to be a part of this major Washington event you need to apply through an on-line website (http://www.ncacdc.com/). After you have signed up you will be verified and considered a “volunteer” for purposes of assignment. You are encouraged to participate in this worthwhile activity which benefits our community and provides us with a live exercise opportunity in message traffic handling. You can apply generally and receive an assignment commensurate with your background, training and equipment. For those of you who are RACES certified you may indicate in the COMMENT box on the on-line form that you wish to be part of Arlington RACES/Arlington Fire/EMS. The hams who are heading up the MCM planning group have been working since at least June to pull together all the various aspects of the communications plan. The net control station (NCS) will again be located on the grounds of the Armed Forces Retirement Home in Washington, DC. It’s a beautiful park-like elevated location in Washington and actually looks down on the U. S. Capitol dome. And its line of sight location to just about everywhere on the race course means NCS can get a signal out to the hams on the course, even SIMPLEX if necessary. But the fly in the oinment is that some operators, ignoring advice, report for duty with an HT and the rubber duck antenna that came with the radio. Frequently this just isn’t enough to insure reliable communications with NCS if you are trying to access a repeater in Rockville or Tysons Corner. So a word to the wise, generally – if you are going to be involved in emergency communications you need a plan that includes a gain antenna and a transmitter that has more than 5 watts. I think this is going to be stressed this year for the MCM. In the latest planning meeting there was an interesting discussion on when the event ended. Did it end when the last runner crossed the finish line? Or since the MCM now officially includes a post-race street festival with medical facilities does emergency communications support end when the Navy closes the last of those facilities. Stay tuned. The race course has been slightly altered from last year in that the runners proceed around a different side of the Pentagon. This entails shifting some mile markers 100’ or more. So if you were on the course last year and can visualize where a particular mile marker was, you will have to update your mental image. This year’s All Hands meeting will be October 20th in Rockville, MD where the most current information will be shared, handouts distributed and questions answered. Hope to see you for the race.